Hardin Sanitation proudly offers reliable and affordable commercial garbage collection up to 5 days per week and as often as the customer needs. From an assortment of carts to commercial dumpsters and compactors, we have options to suit the trash collection demands of your business. If your business is located in Canyon County, Payette County or Washington County, please contact our offices at 208-642-2629 to set up Hardin trash & recycling service. 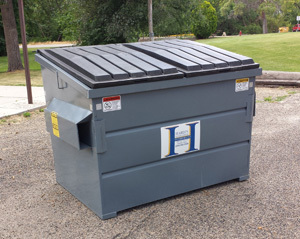 Please call us and let one of our Hardin Sanitation professionals help you determine the size that is most appropriate for your commercial trash removal needs. Pay securely online with your American Express, MasterCard or Visa here. Pay by phone at 208-642-2629, Monday to Friday, during normal business hours. *Please include your Hardin Sanitation commercial account number in the check reference line for faster payment processing. Hardin Sanitation currently offers commercial cardboard recycling to customers in Payette County. Contact us at 208-642-2629 for more information. Commercial Hardin Sanitation customers are billed on the 1st of every month. Payments are due on the 20th of every month.